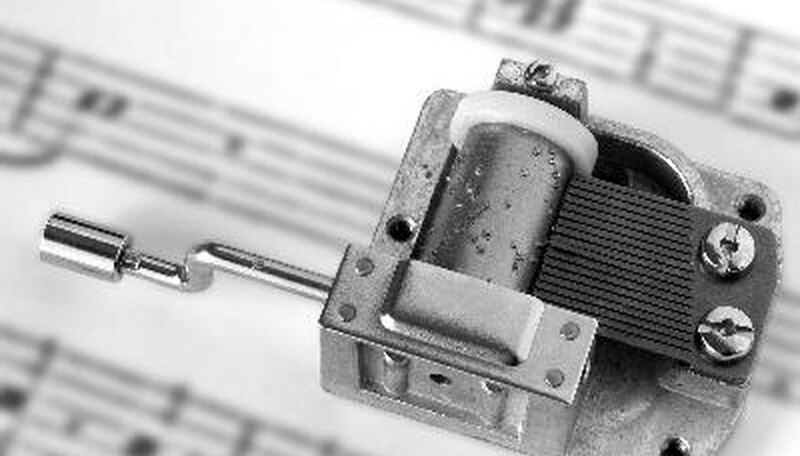 It can be difficult to modify, re-build or build from scratch your own music box cylinder. However, building your own cylinder will give you a one-of-a-kind music box. The music box cylinder is a small spool-shaped metal cylinder that has tiny pins sticking out of it, and rotates when the music box is wound. The pins/wires on the cylinder are struck by tuned metal tines which play the pitches -- notes -- of the song. The spacing of the wires on the cylinder determine when each note or pitch is played, and in what order. Order a comb with all of the notes of the song that you want your music box to play. A music box comb is a small, tuned metal comb with individual tines that each play a different note. You can obtain such combs from a music box order company. They will also usually sell you higher quality cylinders than those that you can get in a hardware or crafts store, so consider getting all of your supplies at the same time. Cut the number of pins you will need for your song. The number of pins you need is the total number of notes that are played in the song, not the total number of pitches. You can have only five pitches in a piece, but there can be over 25 notes in all. The pins should be half the diameter of the cylinder. File down the edges of the pins so that you do not accidentally hurt yourself. Wrap a small sheet of paper around the cylinder, so that it covers the core of the cylinder from one side to the next. Wrap a second sheet of paper around an old music box cylinder, and map out where the pins are located. The distance of the pin locates will determine how far apart each note is from the notes on either side. Draw a series of horizontal parallel lines on the first sheet of paper, and put in dots for where the new pins will go. Drill small holes into the cylinder wall that line up with the dots on the paper. The holes should be just wide enough to fit in a piece of the music wire. Insert the pins into the cylinder until only just enough of the wire sticks out to hit the edge of the tines of the comb. Fill the cylinder with glue, and let it dry. Your cylinder is ready to be played when the glue has dried completely. It may take more than one try to get the cylinder exactly as you would like it. Based in Toronto, Ontario, Charlie Johnson began writing professionally about music and food in 2006. She has worked in the food service industry since 2003 and has been a professional musician since 1998. She writes about music, food, cooking, education and travel. Johnson holds a Bachelor of Music degree from McGill University.